Want to read something inspiring? Good Time Stories of Coach Muller is for you. I do appreciate his generosity to present me the award. Thank you. 1. I shared my time and effort to assist in a project of a friend. 2. I I provide information I get from the internet to educate neighbors. 3. I I do not become a hindrance to progress. Thank´s it is very much appreciate it. Have to check it later since I don´t have much time as of right now. I do have a question, how do you display the logo on my blog? I´m going to go crazy now looking through all the widgets and trying to figure out how to copy and paste or whatever you have to do…..thank you very much. Just kidding, I´m a cave man here, gotta start learning more about the “inside” of wordpress. I´ll do when I get back home to my own computer, hey! I posted a post naming you. Busy as a bee I am but I will stop by. Please click Widget and choose Image. 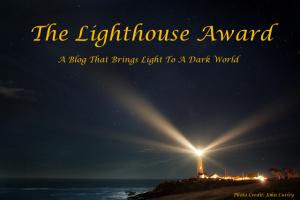 Congratulation on the Award.Its wonderful to be nominated for” the lighthouse Award” by you.Thank you for your encouragement and support.Wishing you bright and beautiful 2014. I wish you and your family only the best for 2014. Congratulations for your award! Thank you so much for nominating the cosmic pilgrim! I am honored , Belsbror! You are the light of the world. We all are in our own way. Blessings to you and your whole family. Merry Christmas and joyous New 2015,may peace and love Brighten every corner in our world.